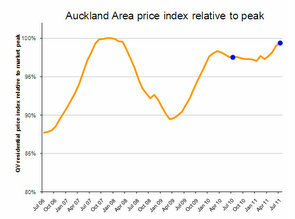 Values in Auckland are up 1.9% overall from a year ago, while prices in central Auckland are up almost 3%. Government owned property valuation service Quotable Value (QV) has reported house values were stable nationwide in July. But QV said there were signs of strengthening valuess in central Auckland and Christchurch, while values were falling in Wellington and flat in Hamilton and Dunedin. QV's figures are issued monthly and measure movements in values compared on a 'like-for-like' basis in the three months to July. They look at prices for certain properties in certain suburbs and compare them with similar sales a year earlier. The QV figures differ from the Real Estate Institute of New Zealand's (REINZ) figures in that QV's figures look at 'like for like' values rather than raw prices in any one month. REINZ's figures are for median prices for sales in any one month and are therefore subject to being skewed by larger numbers of sales in any one price bracket, although REINZ does issue a stratified median figure that filters out the 'skew' effect. REINZ's figures are seen as more volatile, but up to date than QV's figures. “Over the past three months values have increased in many parts of the country, with particular strength in the Canterbury region and parts of Auckland” said QV Research Director Jonno Ingerson. “Across the wider Auckland area values have increased 2.4 percent since January, and as a result are now 1.9 percent above last year and only 0.6 percent below the previous market peak of late 2007. This growth in values over the past few months has not been evenly spread across the Supercity with the old Auckland City growing the most, modest increases in Rodney, North Shore and Waitakere, while Manukau, Papakura and Franklin have stayed more or less stable” said Ingerson. “Values in Hamilton, Tauranga and Dunedin have all been relatively stable for the past six months, although declines in the six months prior to that mean that all three areas remain below the same time last year” said Ingerson. Wellington values have fallen 1.8% since January and now sitting 2.7% down from a year ago. "Possible Public Sector restructuring remains a dampening factor in the property market," Ingerson said. Christchurch values had been volatile with increases after the September quake, then falls just before the February quake, and then rises afterwards. Values across Christchurch have grown 1.1% over the last 3 months and are now 0.5% above the same time last year. "The increase in recent months is due to increased demand for properties in undamaged areas particularly in the West and North of the City,” Ingerson said. Values across the rest of the Canterbury Region had also increased in recent months due in part to demand from displaced Christchurch residents. Values in Ashburton rose 4% over the last three months, while the Waimakariri District immediately North of Christchurch has risen 2.9% and Selwyn District immediately to the West has increased 2.1%. The average New Zealand sales price over the last three months was NZ$414,261, up slightly from the NZ$412,746 reported last month. QV said this is a less reliable measure of value change than its index. QV said values in most provincial towns remained below the same time last year. Wanganui is the furthest below last year at 6.8% down, with Gisborne down 4.6%, Invercargill down 4%, Whangarei down 2.7%, Rotorua down 2.9%, Hastings down 1.0%, Napier down 1.5%, New Plymouth down 2.6% and Palmerston North down 1.0%. Nelson values are at the same level as this time last year while Queenstown Lakes' values were 1.5% up on last year. Values will be hold up as long as the Govt keeps borrowing to pump up the economy...Private sector has maxed out it's credit card...once Govt reaches it's credit limit - then won't be flash for property. I still reckon Auckland property is a better investment than shares - in spite of it increasing in value while shares plummtet. And I'm with you Bob. And where do 'the Auckland buyers' get their money from, Gavin? The bank, after this lot? Certainly not their share portfolios; or their properties that will have to be sold to pay for 'unexpected' losses. I'd suggest that of all places in NZ, Auckland has the most equity market participants, wouldn't you? And here's the realy good bit. There will be a relief rally to this market action - but it's not the end. What would be interesting is the number of re sales within say 6 or 9 months..
Are the buyers really home owners again or speculators selling to investors? Check out addresses and resales over the last 9 months in the bottom end of the rental lype house market...around 15% have been brought cheap (220K ) quick flick (15K) sold on for 290K /310K...20 to 30K profit in 3 or 4 months on an intial 10% deposit is not a bad return really. And those that dont sell rent for 400+ per week anyway.